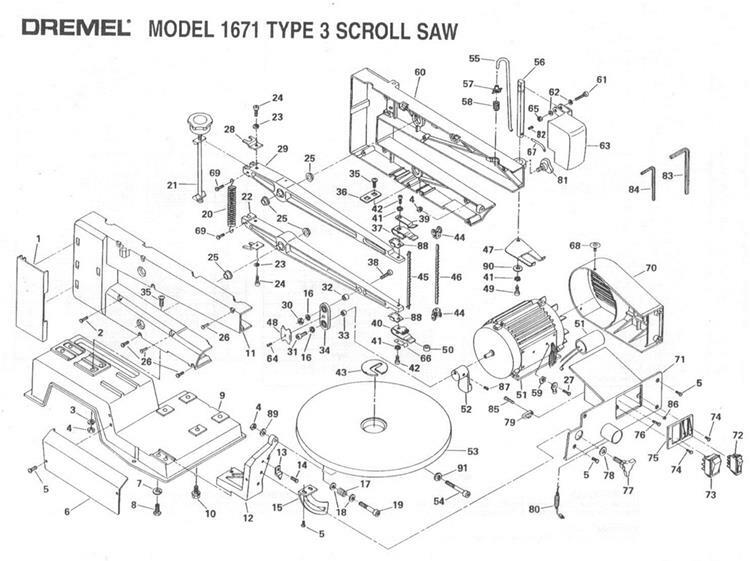 Is The Dremel 1671 The Best Scroll Saw For You? In a word, yes. If you’re a beginner to serious hobbyist, the Dremel 1671 is perfect for you. But probably not if you’re a professional. By professional, I mean high volume, day in and day out mass production. However, information on the Dremel 1671 can be an elusive little devil, can’t it? Even my contact at the Dremel mfg co. had a hard time getting any specs on it. So I went out and purchased the best model I could find in order to get you all the information you need. It will take me a while to be able to cover all the things I’ll want to, so keep checking back here. 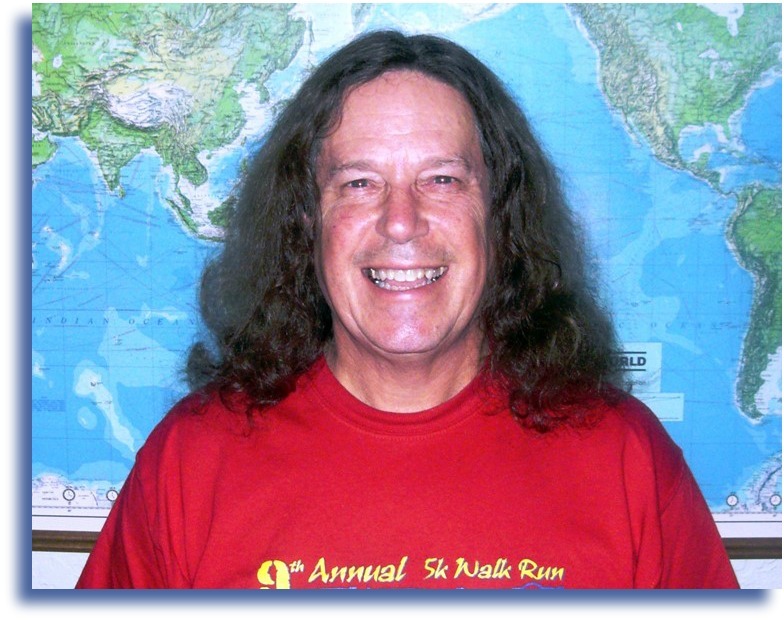 Even better, I put a form at the bottom of this page for you to submit any info you may have, or you can make a request to get as much info in one place as we can for everyone out there. 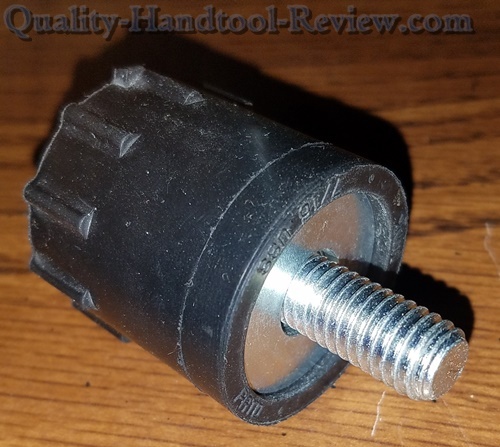 This review is based on a type 3 model Dremel 1671 scroll saw. I’m not sure the differences that the other types may have. If you know of any differences, you can write them up at the bottom of the page and let us know! The body, Base, and leg set of the Dremel 1671 is made of a sturdy metal with few plastic parts. But even so, at around 40 - 50 lbs. it’s still easily lifted and moved around the shop. Even better; lockable casters could be mounted on the legs to allow you to roll around with ease. are all plastic, none look overly cheap (being plastic and all), and are still available for replacement from several different vendors (with the exception of the switch case which has the plastic shop-vac attachment). But, believe it or not, the best prices I’ve found so far on Dremel parts are with a trusted company that has been around for over one hundred years called SEARS. Yup, SEARS has some of the best selections and best prices for this old tool. The only thing I could see that I would feel I would have to be careful around is the blade/wrench holder when it’s open. One good whack and it could break at the hinge and it looks as though it could wear through over time, causing the door to fall off. However having said that, the unit I bought is 12 years old and is still in perfect condition even though it was in a busy shop and used often. I had a blade fall through the poorly sealed door from vibration (visible in the video below) during operation as well. Although I’ve heard many tales to the contrary, overall vibration was minimal and could be lessened even further by mounting the saw unit on the leg set with a piece of carpet (or similar) between them. The sawdust blower tip is made of sturdy brass. The base and leg set (an option along with the light that mine was equipped with). Are both made of sturdy steel that can take not only quite a bit of abuse, but can also handle any welding you may want to do if you have any add-ons or modifications in mind. So, the conclusion here is this; the Dremel 1671 is a very sturdy, well made tool over all. You should be able to find one on Craigs List or Ebay for anywhere from $75-$125 (in 2013) in good shape. And for that money, you will have invested in a tool that will last not only through your many years of creating quality items, but also your children’s if you chose to leave it to them. In addition, they hold their value well so you can get much or all of your money back if you wanted to sell it some day. 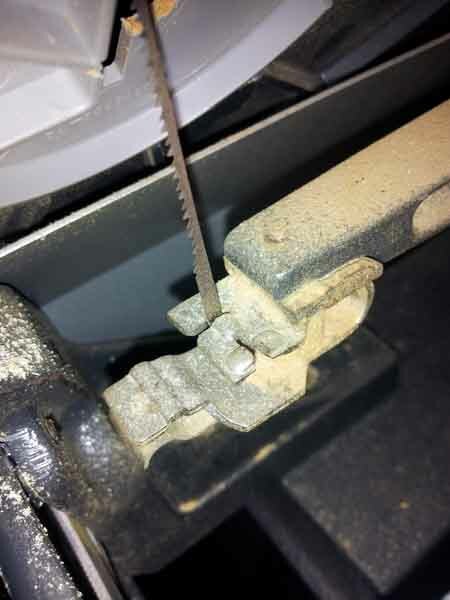 One of the first things you’ll need to know about the Dremel 1671 scroll saw is how to change the blades. 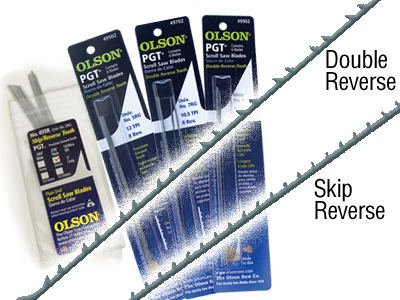 Olson Scroll Saw Blades makes a conversion kit that adapts your scroll saw to accept both pin end and plain end blades. 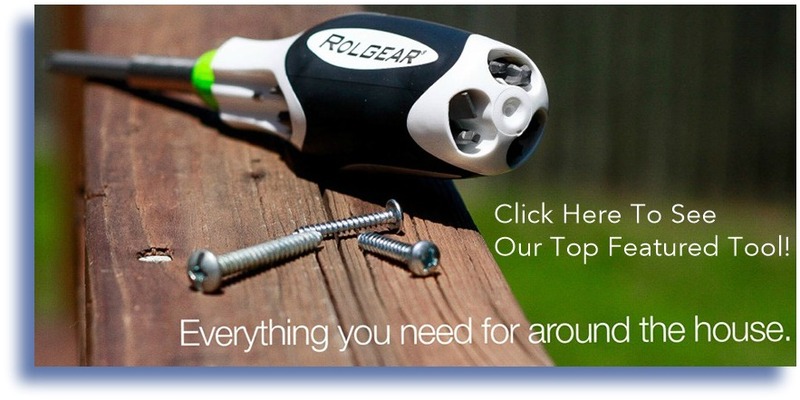 It's easy to install and includes all hardware and tools! 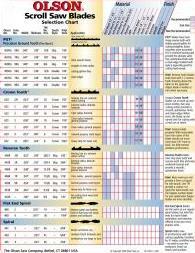 Get an idea of this handy conversion by reading the instructions here (PDF). 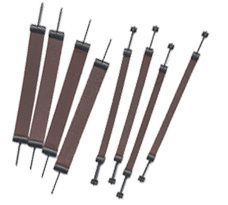 Pin-end blades for cutting wood up to 2” thick. A simple upgrade in your blade quality will bump up the quality of your work with no extra effort. In fact, your work will be easier and produce better results. Those clean, easy, fast cuts you are looking for? 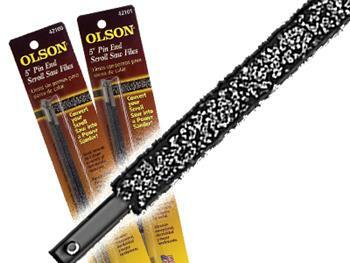 You can get them with Olson blades. 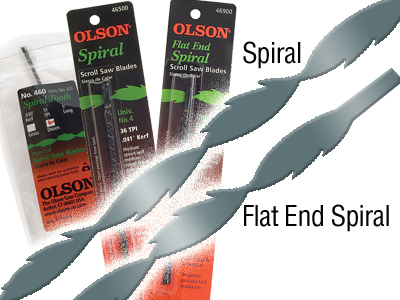 Olson Scroll Saw Blades will help you produce your finest work with fewer blade changes. First, the pin end blades. 1. 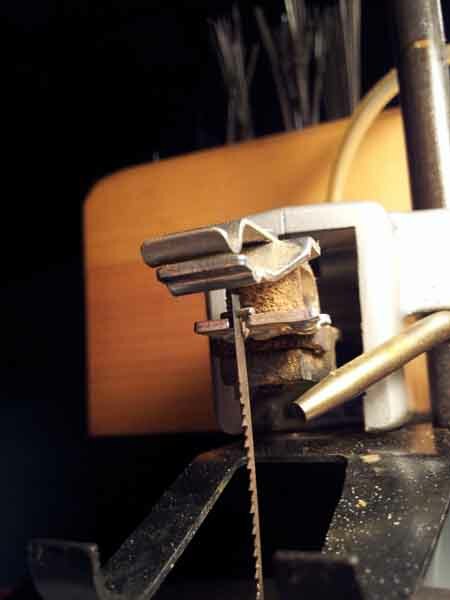 Rotate the tension knob counter-clockwise to release blade tension. Click on the first picture to scroll through a quick step by step instruction gallery! 2. Remove the table insert and remove the blade from the upper and lower blade holders by lifting up on the blade to release the top (you may have to pull up hard enough to raise the lower arm). After release, push down on the blade just enough to pull it free. Wala! A free blade. 3. 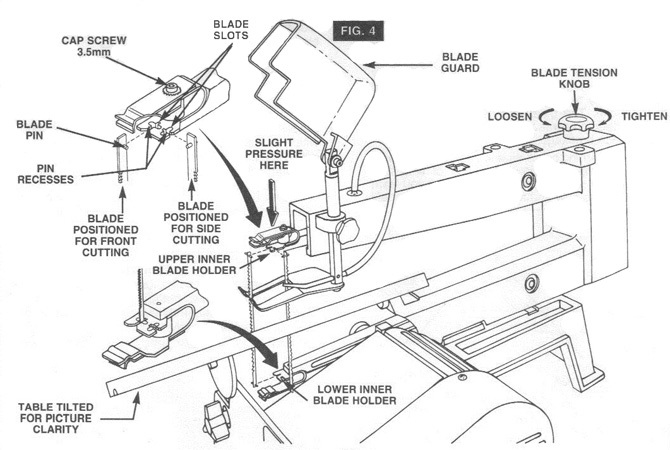 Look at the blade holders and notice the blade slots and pin recesses in the blade holders? There is a set of pin recesses for cutting from the front or from the side. The set for the side is for when the piece you’re cutting is longer than 16”. 4. 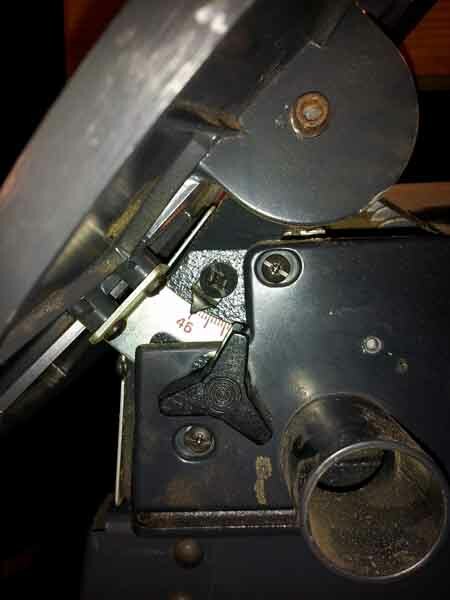 Install the blade by inserting one end of the blade through the access hole in the table and hook the blade pin in the recess in the lower blade holder (I found this easier to do if I tilted the table to 45 degrees to give full view of the lower blade holder, but this could just have been caused from poor lighting). Re-set your table to 0 degrees and pull the blade up and set it into the upper blade holder (you may need to press down on the upper holder). Tension blade properly! 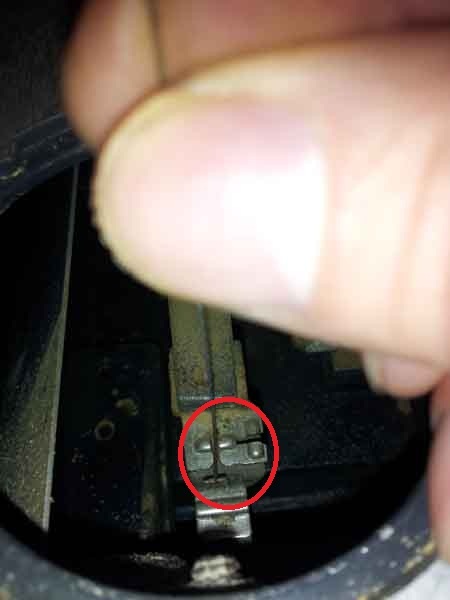 With reasonable force the center of the blade should not move more than 1/8 ′′ front to back. Too little tension weakens performance. 5. Rotate the blade tension knob clockwise to tighten the blade. You should tighten it just enough to take out the slack, then one full turn more AFTER checking to make sure that the blade pins are fully seated in their holders. You will break fewer blades the tighter it is. 6. Replace the table insert. Congratulations on your first blade change on your Dremel 1671 Scroll Saw! 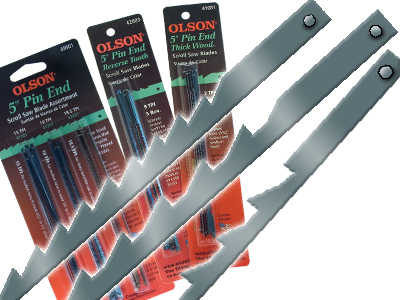 You can find the quality blades you need at Olson Saw. Always Disconnect The Power First! The most important part of a tool having a long, useful life starts with proper maintenance. And the most important part of the maintenance of a tool is lubrication. 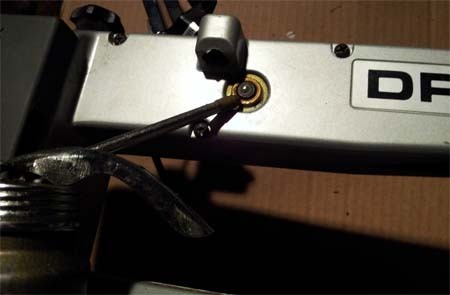 Thankfully, the lubrication maintenance on the Dremel 1671 scroll saw is very simple, quick, and easy. The only things that need regular oiling are the arm bearings. 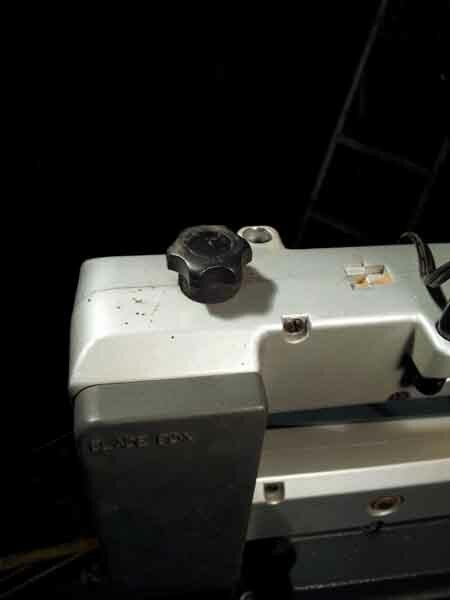 You’ll need to lubricate the arm bearings every 50 hours of use or whenever there is any noise coming from the saw. And since I'm sure that you are like me and don't have an hour meter attached to your saw, just pick a regular interval based on how often you use it and stick to it. You can't really over do it, so once a month? Probably overkill, but "Overkill is Underrated"©. Every other month? That will probably be fine too. 2. Squirt plenty of 20 weight oil around the shaft end and bearing. 3. Leave it resting on its side and let the oil soak in overnight. 4. Repeat these steps the next day for the other side. And while you’re at it, go ahead and blow out the dust that has built up in the motor and rub a coating of wax on the table top. This will make your work slide easily over the top while you’re working, making for better control and much smoother cuts. That’s it! Easy. 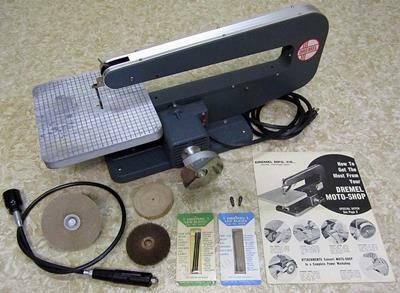 And this simple process will make your scroll saw last for many more years. Beginning scroll saw techniques with projects to improve your skills. 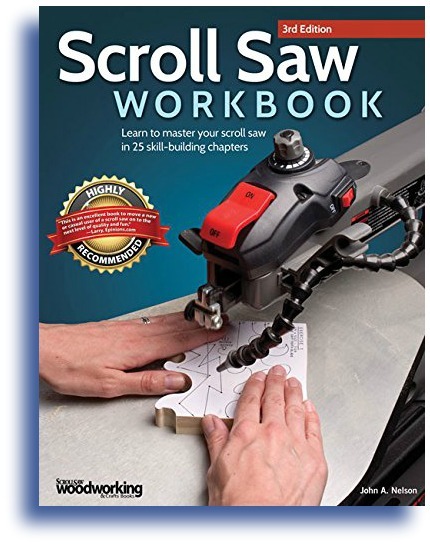 25 progressive chapters to build on, allowing you to get better and better with your saw. 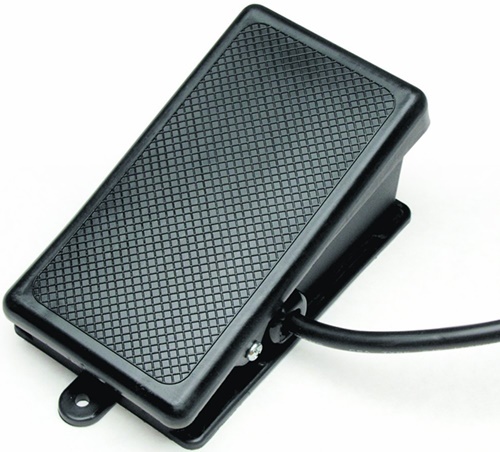 MLCS Woodworking makes a handy foot switch that allows you to turn your scroll saw off and on while keeping your hands free. 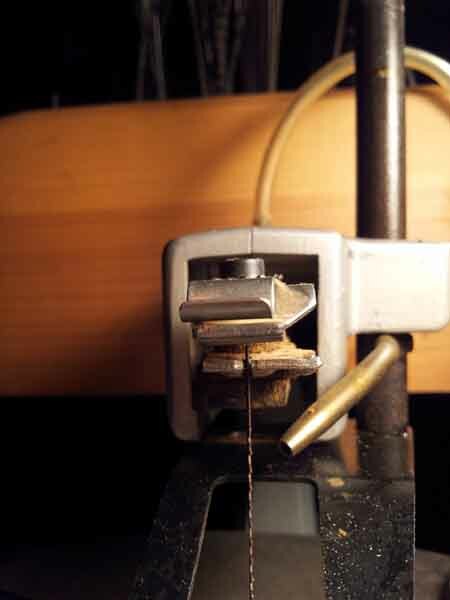 Plug your saw into the switch and the 8' cord into the wall for convenient, hand free operation of your scroll saw. 120V, 15 Amp Max. 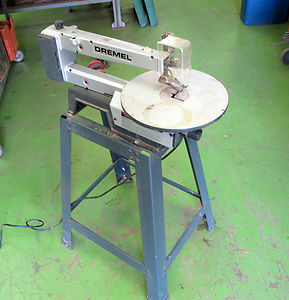 A precursor to the Dremel 1671 scroll saw is the Dremel Moto-Shop. A pretty handy little tool for its day. In a time when fathers and sons were making pinewood derby cars for cub scouts and men were likely to do more handy work around the house. Now, If you’re ready to REALLY step up to the big (home based) leagues (woodworking, 3D printing, relief cutting, hardware creation, etc., etc. ), check out our reviews on Dremel CNC’s. 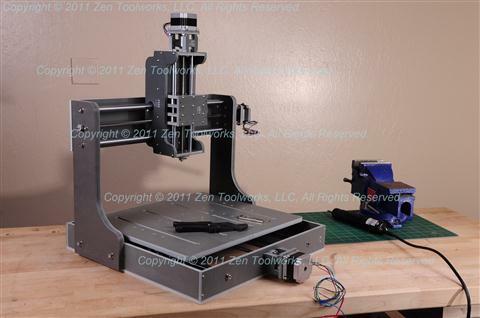 You can build an incredible CNC mill to use with your Dremel 4000 for less than $700! What kind of experience have you had with the Dremel 1671? What projects have you created with it? Tell us about any pros or cons that you have seen. Do You Have information About The Dremel 1671?